…”Top of the lake” is a trip well worth taking. 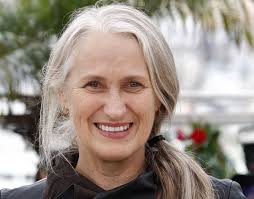 New Zealand-born director Jane Campion, perhaps most known for the both Academy Award and Palme d´Or-winning “The Piano”, is the creative force behind this most unusual TV-series. Campion wrote the script together with Gerard Lee and shared directorial duties with Garth Davies. While first aired in the spring of 2013, I didn´t get around to watching it until now. Not really knowing what to expect I must say that this was a positive surprise in many ways. 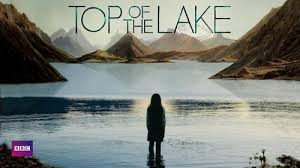 Set in the small town of Laketop, New Zealand, the first scene shows a young girl leaving her home to wade out up to her neck into the cold waters of the titular lake. Beautifully shot and instantly making you wonder what´s going on, it´s an opening that will make sure to keep you nailed to the screen. The girl is 12 year old Tui, who after being rescued is discovered to be in an advanced stage of pregnancy, promptly turning this into a matter for the local police. Sydney Detective Robin Griffin (played by Elisabeth Moss of “Mad Men” fame), who´s back in her old hometown visiting her sick mother is brought in to help with the investigation. Without giving the police any answers to what has happened to her Tui disappears, leaving Robin and fellow Detective Al Parker fumbling in the dark. Very much like “Twin Peaks, Laketop proves to be one of those small towns very everybody knows everybody and everyone is connected by bonds either out in the open or carefully hidden. As we gradually learn during the series, even Robin has dark memories from her adolescent years living in Laketop, as well as convoluted relationships to several of the other characters of the show. While the criminal investigation into Tui´s pregnancy and disappearance is the main thread of the series, it intersects with several other parallel storylines adding richness and colour to what otherwise could have been just another police procedural. One of the most important characters are Matt Mitcham (played by Peter Mullan), head of the Mitcham-family who´s barricaded in an enclave surrounded by barbed wire, and with his fingers into almost everything illegal going on in town. A dark and menacing presence following his own rules, and with deep roots at all levels of the community. Despite just comprising seven episodes, there´s a lot going on here with entangled subplots being built up and then sometimes just allowed to sort of peter out. Some of them are quite strange, most so the new age commune lead by mysterious guru GJ (played by Holly Hunter), who set´s up home for herself and an assortment of psychologically damaged women in shipping containers on a piece of land claimed by Matt Mitcham. Bizarre but still strangely captivating. The main story has to come to an end of course, and without disclosing too much I have to say that it´s slightly disappointing. Movie-savvy and observant viewers will already have it figured out before the final twist, which in addition feels a bit far-fetched and unoriginal. Regardless of those small reservations this is an intriguing story told with an original voice. The plot is given time to develop, as well as the characters. There´s a special atmosphere that you rarely get in TV-series, that while sharing some similarities with “Twin Peaks” still holds its own. Much of the content is pretty dark stuff, dealing with its main theme of sexual violence in a way that´s making it feel real instead of speculative. Should definitely be seen by everybody interested in quality television. This entry was posted in Movies and TV-series and tagged Elisabeth Moss, Jane Campion, Peter Mullan, Top of the lake on January 20, 2015 by danolofohman.